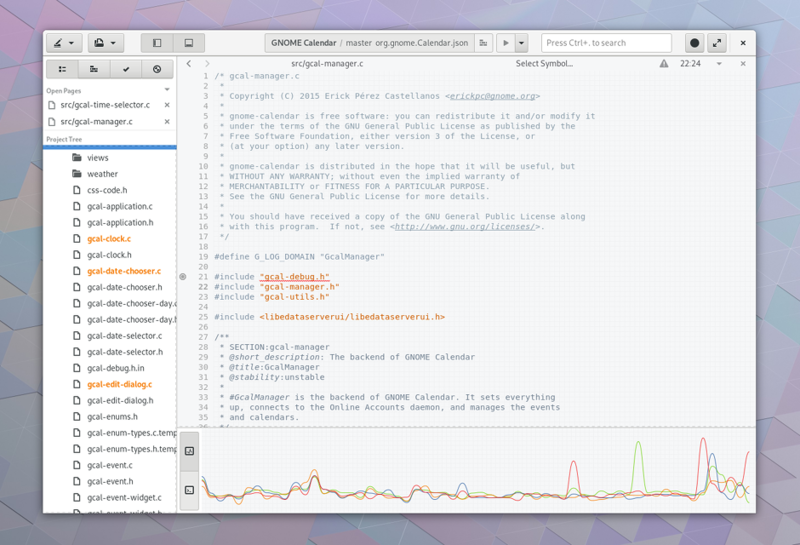 GNOME 3.28 includes many new features and improvements for those working with GNOME technologies. Read on for more details! Builder’s 3.28 release includes some handy new features, important refinements, and significant reliability improvements. The navigation sidebar has had a number of improvements. The file tree is now monitored in real time, so that file changes are immediately reflected in the sidebar. It is also possible to move files using drag and drop, and Git status is shown, so it’s easy to see which files have been changed. Builder’s Flatpak support has also been improved for 3.28. Progress feedback is now shown when building, SDK extensions are now supported, and flatpak-builder is bundled as part of the Builder flatpak, so that it doesn’t need to be separately installed. Progress information has been improved in the build panel. This now shows all the steps in the build process and which point the current build has reached. Three-finger-swipe can now be used to move pages left or right. Builder tries to avoid building projects immediately upon opening, and no longer auto-updates dependencies upon loading. Terminals now show color text output. Files can be dropped on to the editor window in order to open them in Builder. Builder now makes it even easier to contribute to existing GNOME applications, with a selection of featured apps that can be picked from project selection screen. New project templates are now included, including a Mono-based Gtk# application. Finally, the latest version of Builder comes with a technology preview of a new unit testing feature. This is being released for initial testing and improvements are planned. Flatpak has made significant progress since the last GNOME release, with a total of 17 releases of its own. These have included a new 0.10.x stable series, which incorporates the enhancements in the 0.9.x branch. Many of the improvements have concentrated on reliability, performance and overall quality. New features include GTK+ theme handling, as well as language configuration support, which ensures that application translations are automatically installed when required. A new search command, which returns matching applications from all your remotes. Commands are now automatically run per-user if they use a per-user remote. The update command now updates flatpaks that have been installed per-user and system-wide. install has a new --reinstall option, which removes the previously installed version before installing the new one — useful when installing a new version from a different source. The new remote-info makes it possible to see information about applications that are in remotes. The --log option shows the history of the application and can be used in combination with update --commit to roll back to a previous version. Finally, significant progress has been made on Flathub, Flatpak’s new application distribution service. GJS now has a profiler, making it possible to identify where GJS applications spend their execution time. PyGObject is now available on PyPI and can be installed with pip. The latest version of WebKitGTK+, 2.20, builds approximately twice as quickly as before.